Lab will enhance accountability measures against misuse of cryptocurrency while still safeguarding anonymity and authenticity. 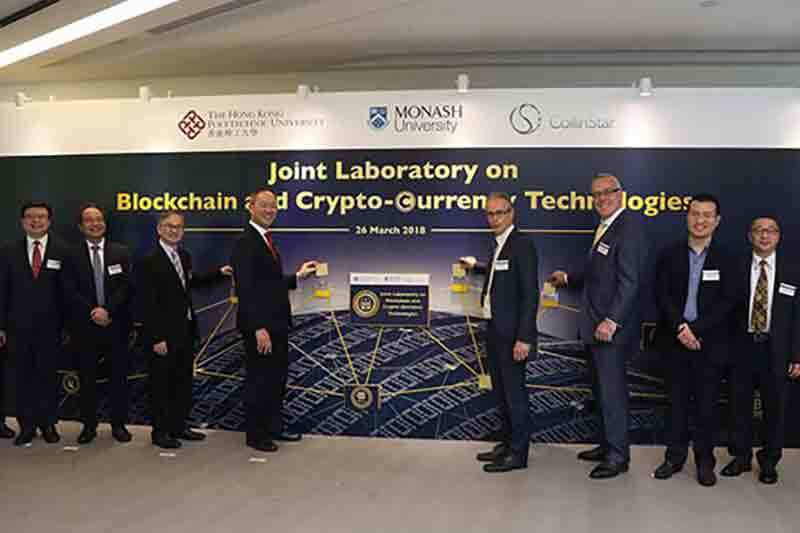 The Hong Kong Polytechnic University (PolyU) recently joined forces with Monash University and Melbourne-based investment institution CollinStar Capital to establish the first university-industry joint research laboratory on blockchain and cryptocurrency technologies in Hong Kong. Advances and applications of blockchain technology is particularly relevant to Hong Kong, given the city’s large financial sector which accounts for 18% of its GDP and 6% of employment. The Hong Kong Government is also determined to develop the city into a FinTech hub of the region. Other than FinTech, blockchain technology can also be applied to various domains such as healthcare, logistics, governance and identity management, thus bringing transformative effects on society as a whole. Despite its potentials, blockchain technology has been facing rising challenges in privacy leakage, control against misuses, hacking security threats, etc. The challenges will accelerate in face of attacks by powerful quantum computers, which may become sophisticated for real application within a decade. This 3-year, multi-million-dollar collaboration aims to significantly enhance the efficiency, privacy protection and security of blockchain technologies against attacks from quantum computing. PolyU’s research team led by Dr Allen Au, Assistant Professor of Department of Computing, will work on enhancing the efficiency of blockchain technology while addressing two key areas of concerns: privacy and security. Dr Au said the team will enhance technologies such as Linkable Ring Signatures system and Zero-knowledge Proof system, which enable efficient proving of the validity of online transactions without leaking private information, such as user identity, transaction amount and account balance. They will also develop protection systems that can be operated on today’s computers yet secured against attacks from quantum computers. To enhance accountability measures against misuse of cryptocurrency such as money laundering, ransom payment request, while still safeguarding anonymity and authenticity, the team will also develop mechanisms for introducing measures such as setting spending/transfer limit, revealing identity under court order, suspending accounts involved in suspicious transactions, etc. These measures are also applicable to other types of blockchain operations and transactions beyond cryptocurrencies. Officiating at the opening ceremony of the Joint Laboratory, Dr David Chung, Under Secretary for Innovation and Technology said the advancement of Hong Kong as a leading blockchain development centre requires concerted efforts from the industry, academia and the Government. “Positioning itself as the leading research and technology advancement centre in Asia-Pacific in the focused areas of blockchain and cryptocurrency, I am confident that the joint laboratory will help foster the development of these technologies in Hong Kong,” he said. Ir Professor Alex Wai, Vice President (Research Development) of PolyU, said the University is in the leading role of blockchain and cryptocurrency research in the Guangdong-Hong Kong-Macau Greater Bay Area. Recently, PolyU also formed another university-industry collaboration with a Hong Kong-based financial institution group to set up the AMTD FinTech Centre of PolyU Faculty of Business. The launch ceremony of the FinTech Centre on PolyU campus was officiated by Mr Nicholas W. Yang, GBS, JP, Secretary for Innovation and Technology of the Hong Kong. The FinTech Centre will conduct FinTech related research, consultancy and training projects for the financial industry, provide support to start-ups, facilitate exchanges among local and overseas experts, and offer FinTech education for students, financial personnel and the public. In addition to the around 200 academics in the Faculty of Business, the FinTech Centre will also have cross-disciplinary support from experts of other PolyU faculties and departments including computing, engineering and applied mathematics.